The epicenter was near Mount Everest Base Camp, a popular tourist site for post-Army Israelis trekking the Himalayas, but the quake was felt throughout the country and further beyond. Before the earthquake, Nepal’s capital, Kathmandu, was a delightful city, although it was a city with poor building codes, potholed streets, narrow pathways, open garbage areas and white cows that roamed at will. The effects of this earthquake on an already impoverished country have been dramatic. 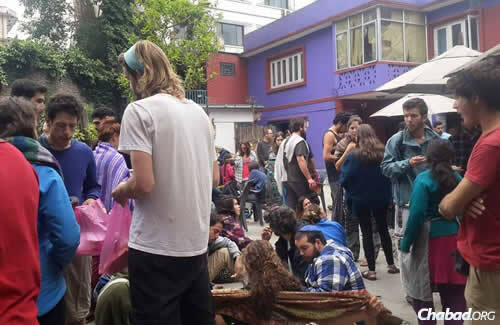 More than 1,000 Jews visit Nepal for the annual Seder and there were estimated to be more than 500 Israelis in Nepal at the time, as well as Jews from other countries. Prime Minister Netanyahu immediately announced that, “Israel’s top priority is to locate and extricate Israelis in distress and to help them return safely to Israel.” Indeed, the first plane to reach Israel returned 338 Israelis and 25 infants, less than 2 days after the earthquake. There were many other tourists in the country at the time, various nationalities; trekkers and adventure travelers. Along with the 28 million who live in Nepal, everyone faced chaos and danger in a country because so little has changed over the last 50 years. As if to mock further, nature showed its power again on May 12th, when the multitude of first round aftershocks were dwarfed by a massive 7.2 tremor. Although a quarter as strong as the initial jolt, the May 12th quake caused new loss of life and destruction. Mansour Kohanteb, 67 years old and an excellent hiker, lives in Orange County and was visiting Nepal at the time of the first earthquake. His son, Dr. Arash Kohanteb, is an ER doctor who had suggested the trip. They decided to make the trek to Everest base camp because it was an experience that would bring, they imagined, a connection to nature and mountains and a magical culture. Now back in Orange County, Kohanteb spoke with The Jewish Home about his extraordinary time. “It was an experience I will never forget, but I don’t wish it on anyone. It was a trip full of miracles and in retrospect I recognize more and more of them. We arrived in Nepal about a week before the earthquake. We were trying to reach the tiny airport of Lukla, which is in the mountains. The weather was so poor that our plane couldn’t take off, so we waited with a Dutch family of five, and we were all so frustrated by the wait, but now I see this was a miracle as the delay kept us out of the worst areas. We finally decided to take a three day break until the storm passed. We went south to Chitwan National Park, then finally, we returned to catch our flight and we reached Lukla. 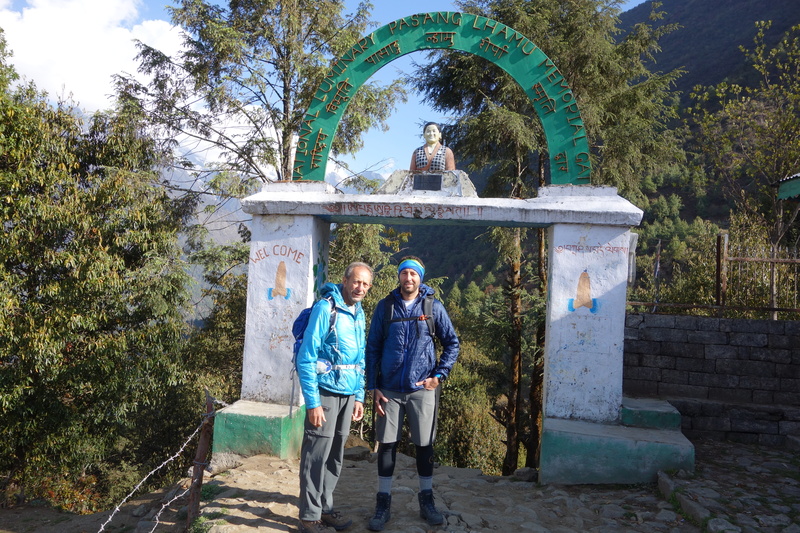 Lukla offers a starting point for a hike that for us would have been a twelve day round trip to Everest Base Camp. “For two days we had been hiking through areas of steep mountain cliffs and occasional meadows of flat grassland. An Israeli walker passed us as we climbed the mountain on the third day. He was walking faster than everyone and we were impressed with his immense strength and fitness. A porter took our backpacks ahead of us, so we had only our day backpack when we went for lunch at a small trailside inn. We finished eating and were slinging our daypacks into action when the earthquake hit. “I’ve been in earthquakes before, but this was more severe than any. I told my son we must be at the epicenter. We could not even stand, and had to hold each other. The quake was long, although we managed to get outside. The aftershocks were endless and we could see this little lunch house was on a steep mountainside, on the edge of a cliff. Rocks were tumbling down; it was very dangerous. “Fortunately we texted my wife and daughter in Orange County. They calmly replied to our text, without having any idea of the severity of the situation, but we were so pleased to have thought to write immediately as it became very difficult to communicate after that. Then, we half-ran back, across unstable paths, to a meadow, an open space that we had passed earlier. There was a tea house, barely standing in the clearing. Many other hikers arrived here and we were all scared because giant boulders were falling down the cliffs ahead of us and trees were being snatched up on the way and we had nothing to protect ourselves. Half the little café was destroyed, but the restaurant was made of wood and it was still standing. “The owner, a kind Nepalese woman, offered her dining hall for us to stay overnight. We decided it was far too dangerous to hike down the mountain on the first day and we stayed together the rest of the day. Later, my son went to the small villages dotted all around, to see if he could help people who might be injured. At one home there was a man with a severe laceration to his head, but my son didn’t have his first aid kit because our porter had it with him. He came back to our impromptu camp and asked everyone to lay out any supplies they had with them and everyone was pleased to offer their first aid kits. “The strange thing about human beings is how they come together in difficult times. It was this closeness that we saw as everyone disregarded nationality, religion and language. It was tense but we functioned as a wonderful family. We all thought the same way. It was too cold to sleep outside, perhaps zero degrees, but the dining room could fit us all, so we filled it with mattresses so there was shelter for the night. The Nepalese owner unnecessarily apologized for not giving us a menu and instead she made spaghetti for everyone to eat for dinner. I can say that it was the very best meal I have ever eaten! “The aftershocks were still severe and we were vulnerable and far from home and I knew that we had to have faith. There is a time when logic is no good. Once you accept that bottom line truth, that faith is all there is, and you firmly believe in it and you know it’s true, everything is easier to handle. “The next day, after a broken night because of the aftershocks, we had an oatmeal breakfast and most people left to brave the dangerous descent. We thought it unwise because there were so many shocks so we remained for 3 more days. Later, some villagers brought a food package to my son because they were appreciative that he had been to help them. It was food that had first been given to their temple. We didn’t want it because we thought they need it more than we do, but they insisted and were hurt by our rejection, so we took it to show them respect. “Finally, we decided we had to make our way down to Lukla and to the airport. We arrived to a scene of utter chaos. There were a team of Israelis who were searching for the speed walking hiker whom we had passed before. Back in Orange County we heard that they eventually found his body; he was way up the mountain. Sometimes you don’t know what waits ahead, but there he was running towards his appointment with fate and destiny. It was very sad. “The airport at Lukla has a very small capacity per day, there were probably 3,000 or so, all clambering to get a seat on the small planes that could hold about 14 people. We went to the Lukla hospital and it was partly damaged and had no X-ray so there was really nothing my son could do there. Then we spoke with a group of three Jewish New Yorkers and also with a group of Israelis and everyone was discussing ways to leave. 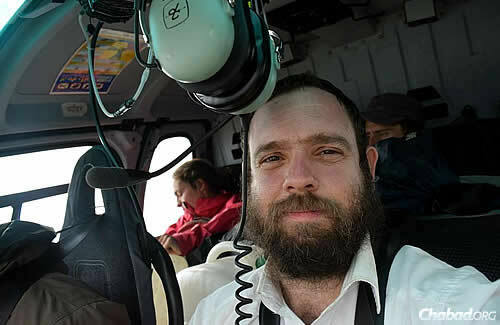 Suddenly, one of the Israelis gave word that Chabad had charted a place and would fly people to Kathmandu! “I texted my wife to contact our Chabad Rabbi in Mission Viejo as he knows us. She reached him and he became very active in trying to reach Rabbi Chezki Lifshitz in Nepal! Finally we met Yehuda, a young, brilliant man, who was organizing the plane for Chabad. I told him we were from LA and he said he had received all our messages and we were on the list for two of the seats on the plane. That was another miracle. They didn’t charge us anything and soon we landed in Kathmandu, yet this was even more disorganized than Lukla. “We made our way to Chabad house and it wasn’t like a normal Chabad house because Rabbi Chezki’s kids had been sent to Israel on the first plane that left after the earthquake. It’s not often that I visit a Chabad house without kids! Rebbetzin Chani was about to visit a neighborhood that needed food, blankets and supplies so we went along in case there was a need for medical help. The atmosphere was incredible. “In contrast to the chaos on the streets, the Israeli contingency at Chabad house were completely calm. You could tell that Israelis are used to rough conditions and they were relaxed and accepting, especially compared to us. I asked an Israeli how quickly he would get home and he laughed at me and said his trip was not over, he was going to India. Israelis are more experienced, especially in their twenties. They’ve seen more, they’ve been trained in preparedness. It shows. “We were worried about the Dutch family who had met earlier in the trip and we never saw them after the earthquake and we kept asking people if they knew what had happened to them. No-one had any news and we knew they had planned to hike for 20 days so we were very worried. On our last day in Nepal we were walking up a small street and we saw them coming towards us. This was amazing! This was like the feeling of the closest family and we were very emotional. In situations like this you find a very close connection with people who you would previously never have bonded with. “The Dutch family had contacted their embassy and had been told to get to the airport in Kathmandu for a plane chartered by the Dutch government for a flight on May 4th. The Israelis had organized evacuation for every Israeli, and the Indian government had made arrangements to evacuate citizens.